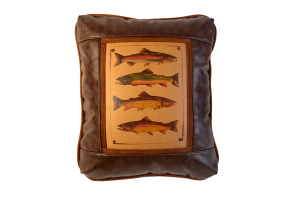 Rich faux leather pillows featuring trout or classic fly designs. 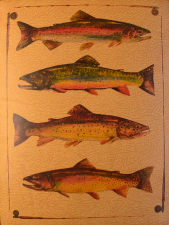 Image is printed on leather, framed with a soft, faux-suede border; back of pillow is rustic faux leather. These luxuriously comfortable pillows look great in cabin or home. Comes with a polyfill pillow insert. Spot clean with damp cloth. Individually manufactured and delivered in ~2/3 weeks. Rectangular 16W x 19H.